Angelina Martinez Miranda is a renowned traditional midwife living and practicing in Morelos, Mexico. The inheritor of three generations of midwifery wisdom; her mother, grandmother and great-grandmother were all traditional midwives, practicing for around 40 years each. She started attending births when she was 7 years old. At 13 she became a mother herself to her rst son and started attending births on her own. Angelina is married, has 5 sons and many grandchildren. Throughout her life she has attended over 15,000 births. Angelina is a long-term member of the Midwives Alliance of North America (MANA) and a founding member of a new state organisation created by the traditional midwives of Morelos. Angelina travels all over the world giving talks and workshops and speaking at international conferences, sharing traditional Mexican practices enriched by modern midwifery and other topics she has studied, to keep up-to-date with evidence-based obstetrics. She is very well respected and is a strong source of inspiration for the many traditional midwives in Mexico who are working to preserve and revitalise their profession for the future. Back in 2017, we held the first certificated foundation training with Angelina in London, UK. At the centre of this workshop, we have the supervised training of Angelina as she teaches the core rebozo teachings for pregnancy, birth and postpartum. We are aware that the international presence of Angelina in worldwide forums has made it possible for many women to state that they have learnt from her, when what actually happened was that they have witnessed her sharing her wisdom. We wanted to prevent this from happening and allow the participants in our workshops to learn supervised by Angelina herself over a number of days. In addition, our 3 day-certificated training also involves the submission of 3 case studies post-workshop which Angelina reviews, providing you with her feedback and encouragement. The Directory of Practitioners that emerged since that workshop in 2017 of birth and energy workers who have been taught by Angelina & Mayella Almazán-Arreola is our way of honouring the time they have spent learning and practicing from the source in an authentic manner. 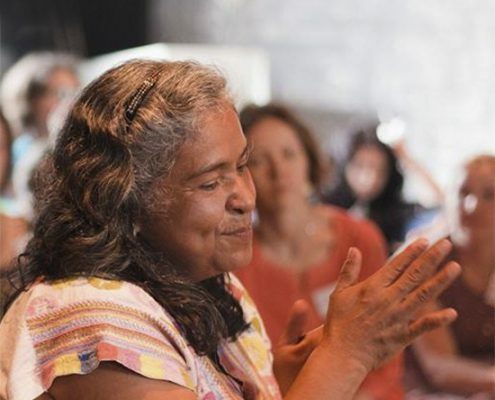 We like to describe the women in this Directory as respectful practitioners in the lineage of Angelina Martínez, as sharing Rebozo Medicine from the Heart. Why is the use of authentic Mexican rebozos important? As the use of rebozo increases in popularity amongst doulas, matronas, midwives, few people are aware of the fact that rebozo-weaving families in Mexico are in serious difficulties. Please ensure the rebozos you purchase are fair-trade, authentic and made of cotton to ensure your practice is ethical and you support this ancient craft from Mexico which is described by some as being in danger of extinction. In this interview with Angelina Martinez Miranda, she shares the importance of using authentic, 100% cotton, Mexican rebozos. When you register in our workshops, you agree to the following. Any information presented on this workshop, our services, products, classes, manual, articles, Facebook group publications, and trainings is not intended to represent they are used to diagnose, cure, treat, or prevent any medical problem or psychological disorder nor are they intended as a substitute for seeking professional health care advice and services. The Organiser reserves the right to refuse You entry to and/or eject You from the Event. In particular but without limitation You may be refused admission to or removed from the Event for any of the following reasons: for health and safety or licensing reasons; if You behave in a manner which has or is likely to affect the enjoyment of other persons at the Event; if You use threatening, abusive or insulting words or mannerisms; if, in the Promoter’s reasonable opinion, You are acting under the influence of alcohol or drugs.